One thing that I love about fall is the local dollar store gets in a shipment of carvable craft pumpkins. I have used them to make my Pumpkin Gang, and this year I have used them to make centerpieces for a friend's nurse retreat. I love how the pumpkins for the retreat turned out so much, that I made a version of my own to keep at home. Instead of leaving the pumpkin it's bright orange color, I decided to paint on a couple of layers of bronze paint. I really like how it looks. The bronze color gives it a nice shine, and definitely glams it up. These pumpkins are carvable. 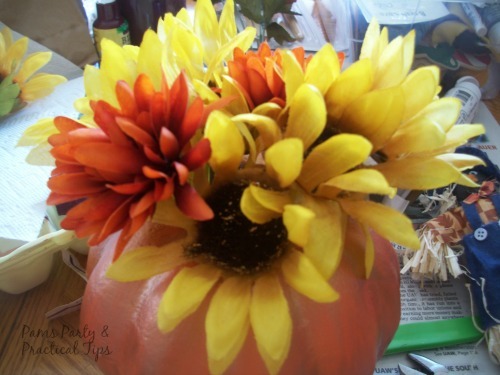 I cut the stem out of the pumpkin so there was a place to put the flowers. I cut and trimmed some of my favorite dollar store flowers. I chose yellow sunflowers and a rust colored mum. Once I felt I had enough in my arrangement. I used a small amount of floral tape (also found at the dollar store) to hold them together. They fit in the hole I had cut nicely. I made a bow with dollar store ribbon, and added it to the arrangement with a small piece of wire. 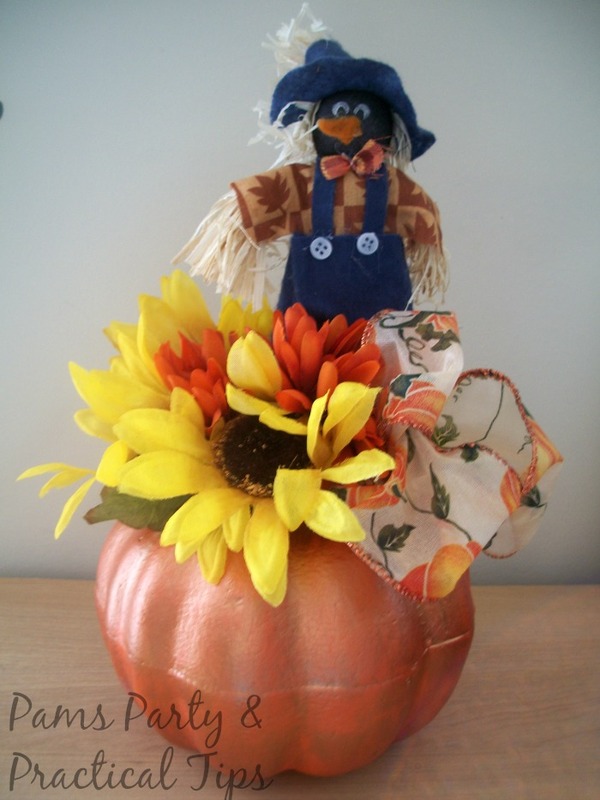 In my fall crafting stash, I also found this sweet crow scarecrow. I believe I got him on sale last year for about $1 at Michaels. I really like how this pumpkin turned out. I might remove the crow at Halloween, and keep the pumpkin out all the way until Thanksgiving. 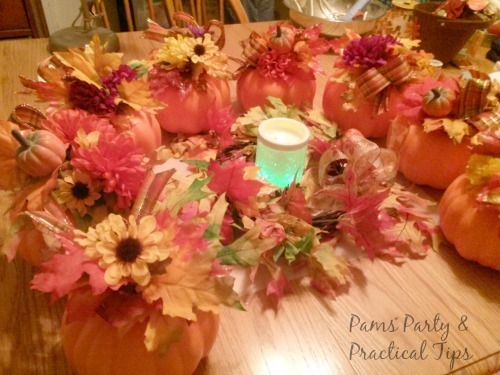 Here is a peek at those centerpieces that I mentioned earlier in my post. They will look pretty on the retreat tables, and are a great way to stay on budget. This is great! Between you and Kim, I need to go buy a bunch of those pumpkins! 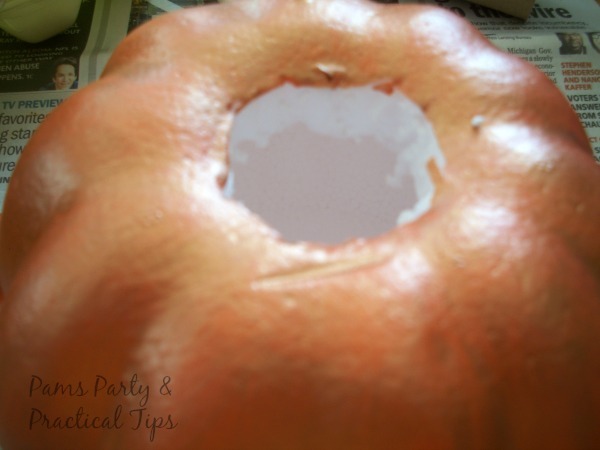 I love Dollar Tree pumpkins and this is a really cute idea for them. I like to buy a bunch every year to play with. I bought some Dollar General pumpkins today, hope mine turn out as cute as yours did. This is a great idea... I need to go and get some pumpkins so that I can do something like this... Pinning this.